S.G. Edelweiss St. Paul Welcomes You! Sitt und Tracht der Alten, wollen wir erhalten! Home | About | Officers | Gallery | Calendar | Membership | Fahnenweihe 2010 | Booking & Contact Info | Donate! S.G. Edelweiss St. Paul is available for booking throughout the year! We have performed at everything from fairs and festivals to Oktoberfests and private parties. Make S.G. Edelweiss St. Paul a fixture in your event for this year and years to come. Join S.G. Edelweiss St Paul! 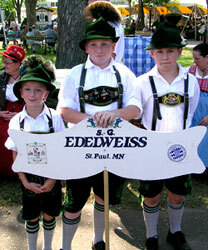 S. G. Edelweiss practices every Monday night at the Klub Haus located at 1079 Rice St. in St. Paul. Everyone is invited to attend and participate! Please click to go to the membership page for details and information about joining S.G.Edelweiss St. Paul!